By applying the innovation process to your next conference you can ensure your conference stands apart from the others and exceeds the expectations of delegates. In these challenging economic times there is a concern among conference, event and meeting planners about how to address the probability of reduced attendance as organizations tighten their belts. One way to compete for limited conference spending dollars is to make sure that your conference is the one that people want to attend. How can you do this? The answer is simple; it is to apply innovative thinking in your planning so that your conference stands apart from the rest. Now is the time to break away from what always been done in the past and create something fresh and new that will make your conference the one that people will not want to miss. As a professional speaker, I have spoken at many conferences over the past year in Canada, the United States, Europe and Asia. The one thing I have found in common in all of them is that, for the most part, they are all very similar—every conference is structured the same. Generally, a conference opens with a welcome reception and follows the next morning with an opening keynote speaker (this is where I am usually positioned). Then there are: concurrent sessions, lunch, afternoon sessions and dinner and, at some point over the course of the 2 or 3 days of event, a closing banquet dinner. It’s all so predictable–the same format and similar content—year after year. Moreover “Academy Awards” style banquets are the norm where delegates dress up to honour members of the association who are receiving awards. More often than not, most of the delegates attending the conference haven’t got a clue about who these honourees are and may have little affinity for the awards being presented. At the end of the conference delegates may feel “let down” by the stuffiness and formality of this final event that is meant to be a highlight of the conference. Isn’t it time for associations, meeting planners and organizations to think more innovatively about their next conference or event? Now is the time to stop being paralyzed by the idea of change and being creative! 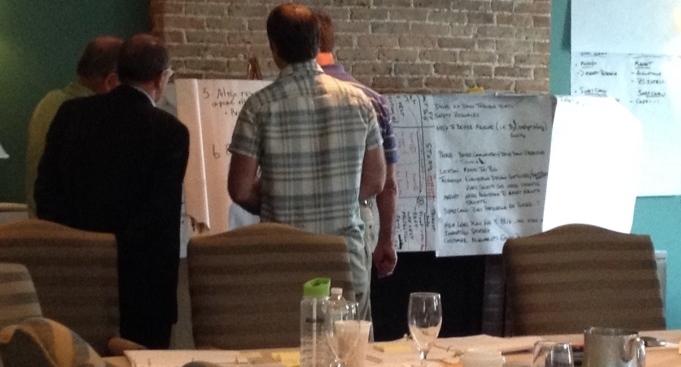 Here are some ways to apply the innovation process to your next conference. What better way to open up the mind than with innovation? Start the conference with a keynote speaker who will encourage delegates to “open up their minds” to new possibilities and help them to begin “thinking outside the box.” The keynote will talk about the need for innovation in your industry or business and explain why it’s important. It will provide valuable knowledge all delegates can take back into their own workplaces. No matter how “crazy” and without restriction or analysis. Ensure every idea is valid and retained. There is no elimination of ideas, rather, just consolidation of ideas into groups. . For example, ideas related to: speakers, format, location, meals, banquet, brochures, notices, social events, receptions, registration, session topics, marketing, etc. Identify the benefits of each group of ideas no matter how “crazy” they may seem. Listing the benefits of the ideas, if implemented, under each category or group if you think for a moment of the greatest inventions of all time you’ll probably think of the light bulb, electricity, the phone, the car, etc. Before moving forward with all of the ideas which led to these “group of thoughts”, the inventors spent time thinking about the benefits before moving into the next stages of their innovation process. Recognize the barriers or obstacles to implementing the ideas and identify how to overcome them. Realistically, there are barriers or obstacles to implementing any of the ideas and groups of ideas, despite their benefits. These can be as fundamental as budget, history, culture, time, resources, etc. They may be more advanced such as technology, organizational structure, departmental layouts, etc. The team begins to brainstorm all of the obstacles and discusses how to overcome most of them. This does take some time but helps team members to see the potential. It is a very positive experience. Rather than looking at why an idea can’t be moved forward they discuss the obstacles and more importantly, what can be done to overcome these obstacles. The session is almost ready to close. The team will have worked hard. They will have brainstormed the innovations, grouped them, identified the benefits and found ways to overcome the obstacles. Now they’ll be ready for the last stage of the innovation process. This stage is where some understanding of project management helps. The teams prepare themselves to present their ideas and the process to successfully implement them, to the association’s management who will come into the session, if they weren’t already there. The association will be responsible for listening and taking these ideas back to their planning committee for the following year’s conference or event. They will be responsible for the development of a detailed plan on how the innovations will be implemented, by whom, with what resources and budget requirements and within what time frame. Without doing this it is unlikely the association will be able to take these innovations and move them into reality. This last stage is crucial and cannot be overlooked because delegates who participated in the concurrent session will be looking for their ideas to be implemented. I strongly recommend that you use the ideas generated and let your delegates know that you are using them. A session about innovation that engages participants through the planning of your next conference is fun, informative and can have a very positive impact on your next event. Let me know how it goes!